The Norwegian ship S S Imo is steaming alone exiting Halifax, Nova Scotia harbor and has ‘Belgium Relief’ written on her sides to emphasize her ‘neutrality’ to U-boats, as she is on her way to New York to load relief supplies for Belgium. The Imo is behind schedule because she had to wait for coal, with this and being empty, she may have been traveling at a faster speed than normal when she leaves the inner harbor. The French ship S S Mont Blanc ss inbound from New York where she had been loaded with a dangerous mixture of explosives and volatile material. The ship had her holds lined with wood, using non-sparking copper nails, but too many volatile cargoes have been mixed aboard. The Mont Blanc enters Halifax harabour with two thousand three hundred tons of wet and dry picric acid; (used for making lyddite for artillery shells), two tons of trinitrotoluene (TNT), ten tons of gun cotton, with drums of Bezol (High Octane fuel); stacked on her decks. The Mont Blanc is on her way to the inner harbor, but arrives too late to be let through the submarine nets, and has to wait from the previous evening to enter the harbor. This morning the Imo weighs anchor and heads for the sea, while the Mont Blanc enters the harbor and they collide in the bottleneck known as ‘the Narrows’. Some of the Benzol drums break loose, spill on the deck, and soon catch fire. The intensity of the fire and its volatile cargo leads the Captain of the Mont Blanc to order all hands to abandon ship. The Mont Blanc on fire drifts towards Halifax where she rests against pier 6. The Captain of HMS Highflyer, which is about a mile away, at once sends off a boat to see if anything can be done to prevent loss of life, and Commander Thomas Kenneth Triggs, volunteering for this duty, immediately gets into the ship’s whaler and pulls to the scene. A tug and the steamboat of H.M.C.S. Niobe are seen going there at the same time. Commander Triggs boards the tug, and finding it was impossible to do anything for the Mont Blanc, decides to endeavour to get the Imo away, giving directions accordingly to the tug. He returns to the whaler, and is pulling towards the bows of the Imo, which is about 300 yards from the Mont Blanc, to pass a line from her to the tug, when at approximately 09:05 a tremendous explosion occurs. The Mont Blanc has blown up, the entire ship disintegrating. The pressure of the blast flattens the immediate area for two square kilometers wiping out the suburb of Richmond, killing 1,600 people, injuring 8,000 and destroying 3,000 dwellings; 2,000 more persons are listed as missing and the total damages are estimated to be more that $30 million. This is followed by a pressure wave that washes up the shore and rocks the ships nearby. Some smaller vessels such as tugs are overwhelmed and sink. Eight crewmen of HMS Highflyer are killed including Commander Triggs. Able Seaman William Becker is rescued alive on the Dartmouth shore, where he had swum after the explosion while the remaining members of the Highflyer’s party all perished. It is clear that after communication with the tug Commander Triggs and the rest of the boat’s crew were fully aware of the desperate nature of the work they were engaged in and that by their devotion to duty they sacrificed their lives in the endeavour to save the lives of others. Commander Triggs and Seaman Becker will be awarded the Albert Medal for their efforts. The others were not recognized with this award but deserve mention. They are Able Seaman James Dowling, Engine Room Artificer Robert Jones, Stoker Francis Kelly, Able Seaman Joseph Murphy, Able Seaman Samuel D Prewer, Stoker Edwin B Rogers, Lieutenant James R Ruffles, and Leading Seaman Claude E Rushen. Commander Triggs brother will die on service at home in Canada in September of next year. The Commanding Officer of H.M.C.S. Niobe, which was lying in the harbour, on perceiving what has happened, sends away a steam-boat to see what can be done. Boatswain Albert Charles Mattison (Royal Canadian Navy) and Petty Officer Stoker Ernest Edmund Beard (Royal Canadian Naval Volunteer Reserve) and five men of the Royal Naval Canadian Volunteer Reserve volunteer to form the crew of this boat, but just as the boat gets alongside the “Mont Blanc” the ship blew up, and Mattison and Beard and the entire boat’s crew lose their lives. The boat’s crewmen are fully aware of the desperate nature of the work they are engaged on, and by their gallantry and devotion to duty they sacrificed their lives in the endeavour to save the lives of others. Among the dead are two crewmen of HMCS Niobe, who will be awarded the Albert Medal for their efforts on this day. Petty Officer Stoker Ernest Edmund Beard is killed at age 30, while Boatswain Mattison is killed at age 44. Both men will be awarded the Albert Medal Posthumously. The tug Musquash is seen to be on fire forward. The fire is increasing, and there appears to be a great danger of her getting adrift, and being carried down on to another vessel. As the Musquash has a gun and ammunition on board there is danger of a further explosion and consequent loss of life. The Captain of Highflyer hails a private tug and asks her to take the Musquash in tow, but as they were unwilling to board the Musquash to get her in tow, the tug is brought alongside Highflyer. Leading Seaman Thomas Davis and Able Seaman Roberts Stones immediately volunteer, and having been transferred by the tug to the burning Musquash, which has by this time broken adrift, they secure a line from her stern, by means of which she is towed into midstream. The line is then parted, and Davis and Stones pass another line from the Musquash to the pumping lighter Lee, which haa now arrived. They then go forward to the burning section, and succeed in getting to the ammunition, which is by this time badly scorched, pull it away from the flames and throw it overboard. They then break open the door of the galley, which is on fire inside, to enable the Lee to play her hoses into it. They repeat the same thing with the cabin. For their efforts both men will be awarded the Albert Medal. A train dispatcher Vincent Coleman for the Intercolonial Railway of Canada is on duty controlling trains on the rail line which ran along the western shore of Bedford Basin. He sends out a message stating “Munitions ships on fire. Making for Pier 6, Goodbye” and as a result trains heading to the docks stop well short of the terminal no doubt saving many lives. Coleman is killed in the explosion. Captain John Foster Chisholm (Royal Naval Air Service) carries out a photographic reconnaissance in the vicinity of Zeebrugge, and for the great skill and determination with which he carries out his duties at all times he will be awarded the Distinguished Service Cross. Flight Commander Rupert Randolph Winter achieves his fourth victory on the way to becoming a five-victory ace. Second Lieutenant James Samuel Emerson (Inniskilling Fusiliers) leads his company in an attack and clears 400 yards of trench. Though wounded, when the enemy attacked in superior numbers, he springs out of the trench with eight men and meets the attack in the open, killing many and taking six prisoners. For three hours after this, all other officers having become casualties, he remains with his company, refusing to go to the dressing station, and repeatedly repels bombing attacks. Later, when the enemy again attacks in superior numbers, he leads his men to repel the attack and is mortally wounded. His heroism, when worn out and exhausted from loss of blood, inspired his men to hold out, though almost surrounded, till reinforcements arrive and dislodge the enemy. For his actions the 22 year old will be awarded a posthumous Victoria Cross. The destroyer USS Jacob Jones is sunk by German torpedo and the British sloop-of-war Camellia and British liner Catalina conduct rescue operations. By 08:30 the following morning HMS Insolent has picked up the last survivors of Jacob Jones. Captain Francis Eyton Spurling (Rifle Brigade) is killed at age 32. He is the son of the Reverend Canon Frederick William Spurling. Lieutenant Russell Winnicott MC (Devonshire Regiment attached Royal Flying Corps) is accidentally killed at age 19 at Cambrai. The 10-victory ace is the son of Alderman Richard Weeks Winnicott JP. 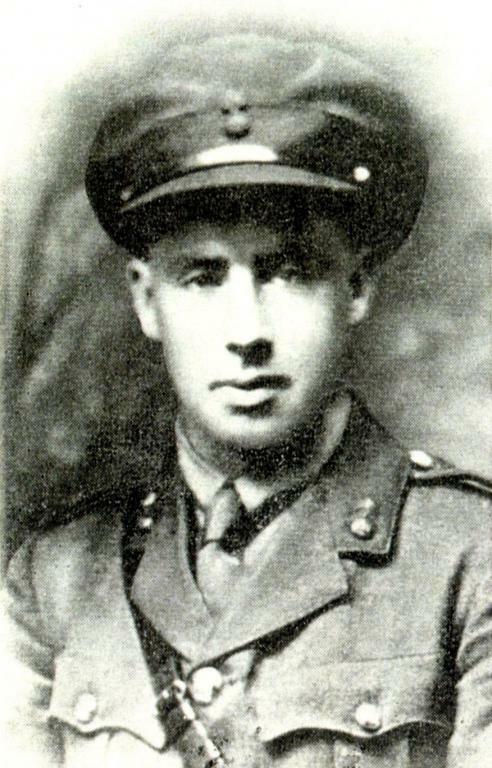 Second Lieutenant William Henry Achurch (Warwickshire Regiment) is killed at age 25. He was a Sunday school teacher and Scout Master. Second Lieutenant Herbert Horace Jarrett (North Staffordshire Regiment) dies of wounds received two days prior at age 29. While overseeing the repair of some trenches that had been damaged by shell fire he was shot in the back by a sniper. His mother and fiancée traveled to France but arrive at the hospital three hours after he has been buried and so are only able to pay their respects at this grave side. His brother will be killed in August 1918. Private Sydney Pearce Longfield (London Regiment) is killed at age 21. His brother was killed in December 1915. Private Thomas Golding (Veterinary Corps) is killed on Salonika at age 39. His brother was killed on Gallipoli in January 1916. Private Walter Edworth (King’s Own Yorkshire Light Infantry) is killed at age 25. His brother was killed on the first day of the Battle of the Somme. Private R J Wood (Royal Fusiliers) is killed at age 20. His brother was killed in October 1916.